Today I present to you a pretty revamp of an old unwanted mens grey marl T-shirt. 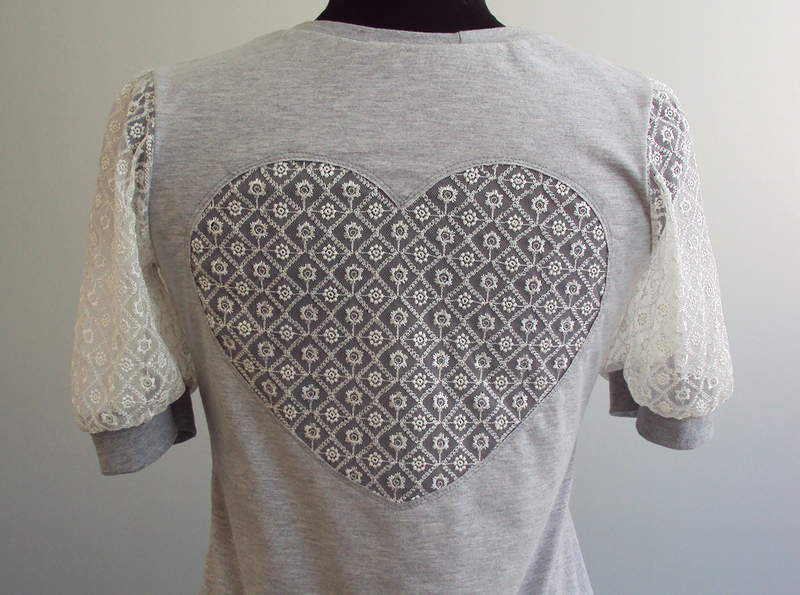 Using a smallish piece of lace, I created soft puffy sleeves and a heart cut-out back detail. The original grey T-shirt was one of those super-soft ones that feels slinky against the skin, which I think chimes well with this girly refashion. 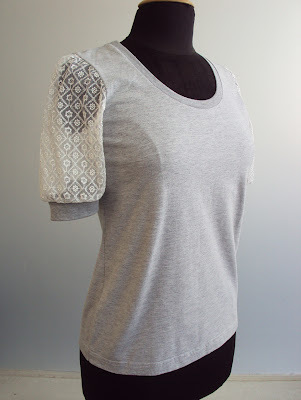 Using a self-drafted T-shirt block, I added a scoop neck line which I bound in a strip of the jersey I made from the removed sleeves. The puffy sleeves have a cuff made from more strips of sleeve. The shoulders and upper arms are visible through the sheer lace, but still kind of obscured. This T-shirt wasn't made for me, but as a woman with largish upper arms, I like sleeves that slightly obscure but not completely hide this area of the body. 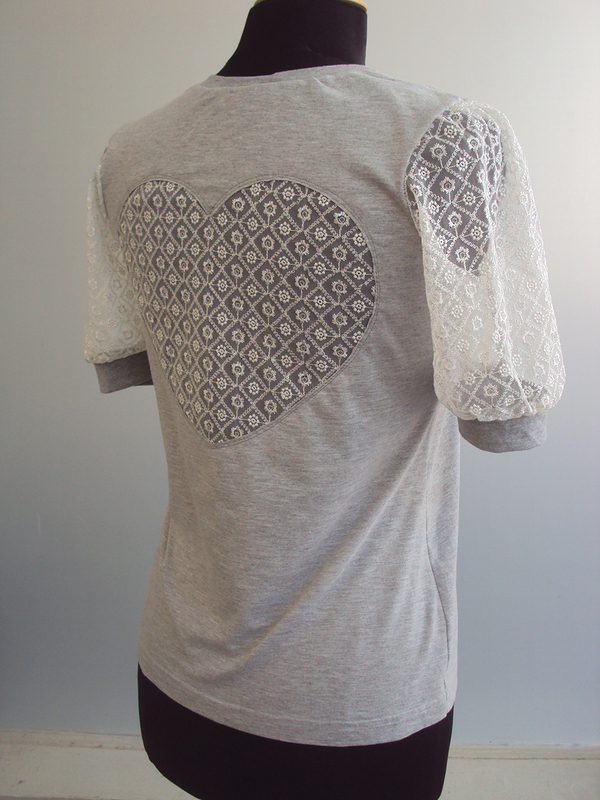 The heart cut-out is created using reverse appliqué. The lace heart-shaped panel was pinned to the wrong side of the back garment piece. 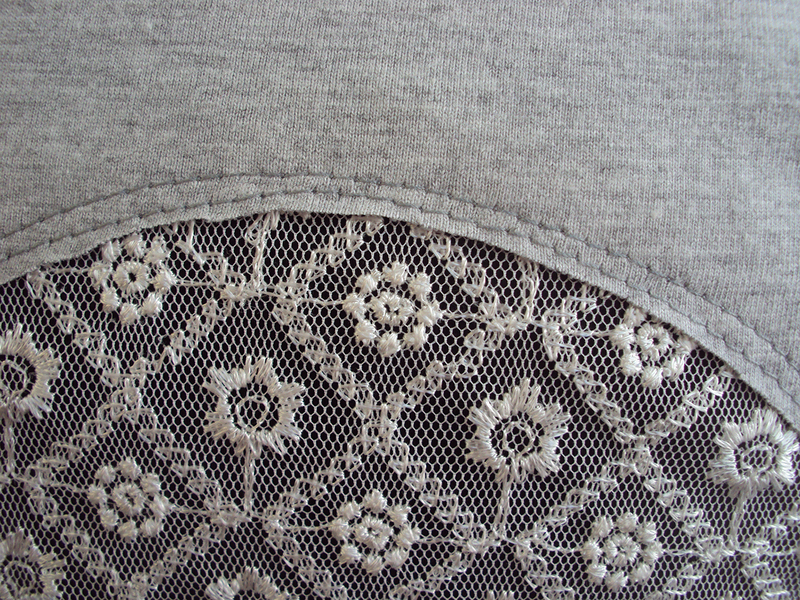 I then stitched two rows of straight stitch close together around the heart shape and carefully cut away the grey jersey from the inside of the stitching, mindful not to snip the lace as I went. Happy refashioning/remaking, my crafty friends. Co cute, thanks for the weekend project! 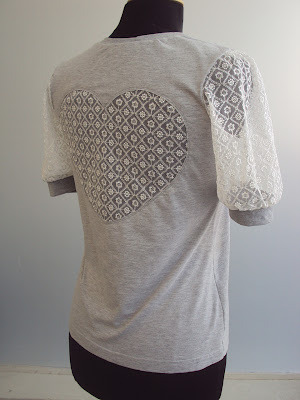 What an incredible refashion, not only is it gorgeous but you also turned some MEN meh tshirt into something so sweet! love it - I love how you do this with t-shirts. I am totally going to try this some day soon. Very cute! 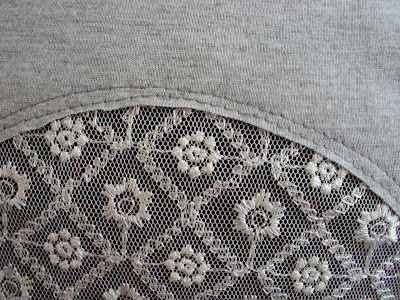 I always find myself wondering though, do people wear these lace-back tops without bras, or just let the bra show bravely through? Great idea! I've got some leftover lace fabrics from my previous projects. I was also saving them for a project like this.. Thanks for the inspiration! such a cute refashion and a great way to use up small pieces of fabric. I have some pink stretch knit lace - this would be a good use for it. Lovin' the lacey cut outs! Oh la, Ii do like this!